The clean, modern lines of the sofa are balanced out by the luxurious tufts of that velvet settee. There are some rich jewel tones (deep raspberry, dark navy) brightened up by bursts of buttery yellow and a pinkish lavender. The apartment itself – with its neutral walls, white trim, and hardwood floors – are pretty typical of a rental, making it easy to relate to and envision your own belongings mixed in. The first thing you need to pull of Felicity's decor? A Robin Hood poster! I absolutely adore that clever little addition that the set designer through in: a vintage poster of 1938's The Adventures of Robin Hood starring Errol Flynn. Pull in the same blocks of color by throwing down a pale fuchsia rug, putting up navy blue curtains, and dressing up the couch with a golden yellow blanket. Then, bring in some pattern on a small scale like Felicity (errr, uh... her set designer) did with the floral-printed throw pillows. Don't forget the little details. Felicity has a lot of books scattered around, so pull some down from your bookcases. She may be tech-savvy, but she's fashion-savvy, too. If you look closely in the upper left hand corner of the first image in this post, you'll see some framed artwork of shoe illustrations. It's a quirky and girly touch – very Felicity! Lastly, bring in some life. Thanks to the big houseplant, small plant, and vase of flowers, Felicity's apartment has an extra bit of energy and freshness. Are you an Arrow fan? What do you think of Felicity's apartment? What bits of her style would you like to steal for your space? 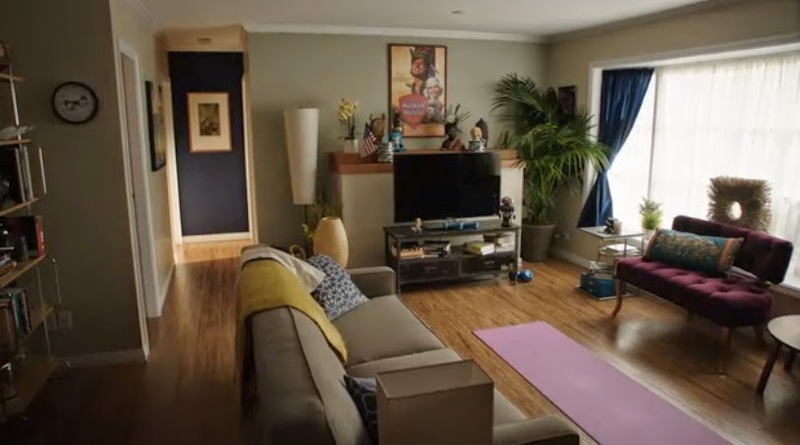 Get the look of Laurel Lance's apartment here. I Love Felicity's apartment! You get to see it a couple times throughout this season, and it totally suites her. I am a total #olicity fan.